The Academy Awards are upon us, and with no more award shows left to give us a look inside the minds of voters, our points-for-wins model is all set for Oscar night. Based on what we’ve seen so far this season — looking at critics’ awards, guild prizes and more — we have strong reason to believe that “La La Land” is poised to win best picture. Here’s the long and the short of why. “Moonlight” beat out “La La Land” in the best original screenplay category at the Writers Guild Awards on Sunday, but that category isn’t very predictive of the best picture winner compared with awards in which “La La Land” beat “Moonlight,” including the Producers Guild, BAFTA and the Directors Guild awards. This isn’t an Oscar season like last year’s, when the producers, directors and Screen Actors Guild all crowned different films, and we were left scratching our heads until Oscar night, when the generally amenable “Spotlight” took home the prize. The primary argument for the primacy of “La La Land” is that it’s won almost every major prize it was nominated for, and its competition has split the rest of the spoils. Nothing else looks like a favorite. The strongest argument could probably be made for “Hidden Figures” given its widespread appeal as shown through box office take and its win at the Screen Actors Guild Awards. Count up all the first-choice votes. If a movie gets a majority, that’s the winner. If none does, eliminate the last-place movie from contention. Take all of the ballots with the eliminated movie at the top. Reapportion them to each voter’s next preferred movie. Go back to step two. For example: Let’s say all the first-choice votes are counted up, and no one has a majority. The last-place movie — “Hell or High Water,” maybe — is eliminated, and all of the ballots that had it as the first choice are reapportioned to those ballots’ second-choice movies. Then the process repeats: If nobody has a majority, the last-place movie — let’s say “Lion” — is eliminated from contention, and the ballots that now have “Lion” as top choice are moved to their next preferred pile. This continues until a movie breaks 50 percent. The effect that this has is that if “La La Land” were every person’s second-favorite movie, it would win the Oscar. It’s why even if we do get an Oscar shock, the result is usually a film that’s recognized as rather good, if not everyone’s favorite. 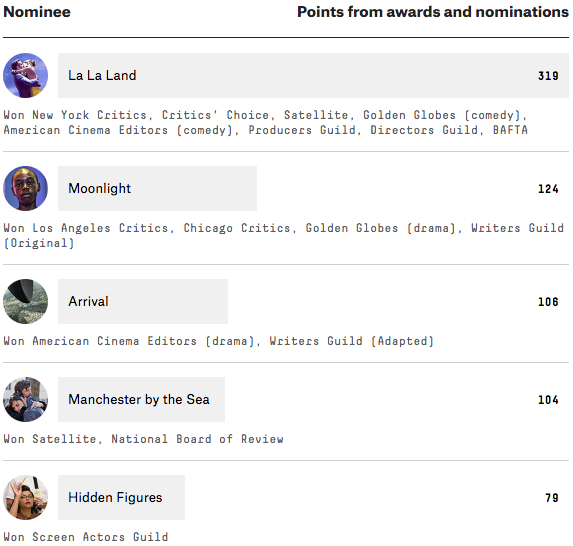 Given that it’s won some of the most predictive awards this year, that it’s a relatively uncontroversial film and that the Oscars are poised to award the film with the broadest appeal based on the voting algorithm, “La La Land” looks to be a shoo-in. VIDEO: Who picks the Oscar winners? It’s how Australia picks its legislature and Ireland picks its president, and if you have a friend who attends lectures by Ralph Nader or has lots of dramatic sweeping ideas on how to make American democracy work better, it’s usually the voting system they’re all about.